Read article in its entirety below. It started when she was 13, Abdominal pain, migraines, nausea – all so excruciating she was often bedridden for days at a time. Trips to the doctor, the emergency room and to specialists all became the norm for Melissa Steward and her mother Karen. “It was frustrating because all of the doctors just left a big question mark in our mind,” said Karen Steward. When Karen first took her daughter to the doctors, they diagnosed Crohn’s Disease and prescribed prednisone. But after extensive research Karen became convinced her daughter was not suffering from Crohn’s. “We would go to the support groups and Melissa’s symptoms were not the same as the other children,” she said. Soon Karen came across a medical reference book. It said to make an absolute diagnosis of Crohn’s Disease granulomas must be detected in the tissue samples. Melissa’s samples showed no granulomas. Doctors, however, continued to label Melissa’s pain as Crohn’s and prescribed organ destroying drug prednisone. Seven years later, Melissa began weaning herself off the prednisone. “It is just wasn’t worth it anymore, “ Karen said. “It was destroying her body and having little effect.” After 12 years of suffering, the Stewards went to the Scott and White Hospital in Temple, known for its specialty in diagnosing unknown diseases. “But even they ignored us and told Melissa needed to accept her disease,” Karen said. “They treated us like Melissa was a hypochondriac and I, her enabling mother. They just acted like all the pain was in Melissa’s head.” Karen said the doctor in Temple was so inconsiderate he persisted in examining Melissa’s back after she pleaded he not touch it. “It hurt so bad,” Melissa said, “and he just did it anyway.” Melissa left Temple crying in pain and told her mother she was done with doctors. “I told mom I was never going to another doctor again,” she said. “That night I realized we had never gotten any help. We had gone to every doctor we could think of. No one was helping us. I felt lost and desperate. I just kept hoping that special doctor would come along to help Melissa. Up to that point my husband & I had been asking God to show us the right doctor, and that night we asked him to show us what was wrong with Melissa,” she said. Karen prayed that year, 2001, would be their year of victory. She searched the Internet day and night for answers – anything that would help explain Melissa’s pain. “I was getting worse,” Melissa said, “then mom called and read me something she saw on a Web Site about endometriosis.” In the years of searching, many doctors had told Melissa she did not have endometriosis, “The web site talked about headache, pelvic and back pain, pulling and tearing pain, stomach pain, vomiting – everything Melissa had experienced for years,” Karen said. 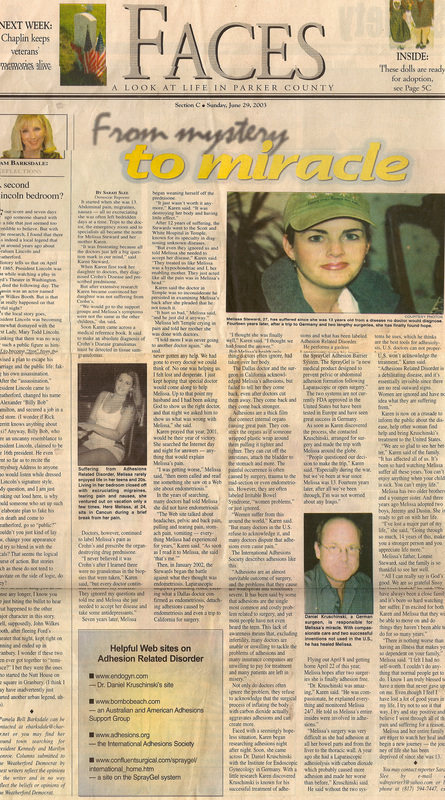 “As soon as I read it to Melissa, she said ‘that’s me.’” Then, in January 2002, the Stewards began the battle against what they thought was endometriosis. Laparoscopic surgeries promising relief, excising what a Dallas Doctor confirmed as endometriosis, detaching adhesions caused by the endometriosis and even a trip to California for surgery. “I thought she was finally well,” Karen said. “I thought we had found the answer.” But Melissa’s health only declined. The adhesions, something doctors often ignore had taken over her body. failed to tell her they come back, even after doctors cut then away. They come back and they come back stronger. Adhesions are a thick film that connects internal organs causing great pain. They constrict the organs as if someone wrapped plastic wrap around them pulling it tighter and tighter. They can cut off the intestines; attach the bladder to the stomach and more. The painful occurrence is often caused by surgery, trauma to the mid-section or even endometriosis. However, they are often labelled Irritable Bowel Syndrome, “women’s problems,” or just ignored. Gynaecology in Germany. With a little research Karen discovered Kruschinski is known for his successful treatment of adhesions and what has been labelled Adhesions Related Disorder. He performs gasless Laparoscopy using his invention, the AbdoLift system and an adhesions barrier made by Confluent Surgical called “SprayGel”. The SprayGel is ‘a new medical product designed to prevent pelvic or abdominal adhesion formation following Laparoscopic or open surgery.” The two systems are not currently FDA approved in the United States but have been tested in Europe and have seen great success in Germany. As soon as Karen discovered the process, she contacted Kruschinski, arranged for the surgery and made the trip with Melissa around the globe. “People questioned our decision to make the trip,” Karen said. “Especially during the war, but we’ve been at war since Melissa was 13. 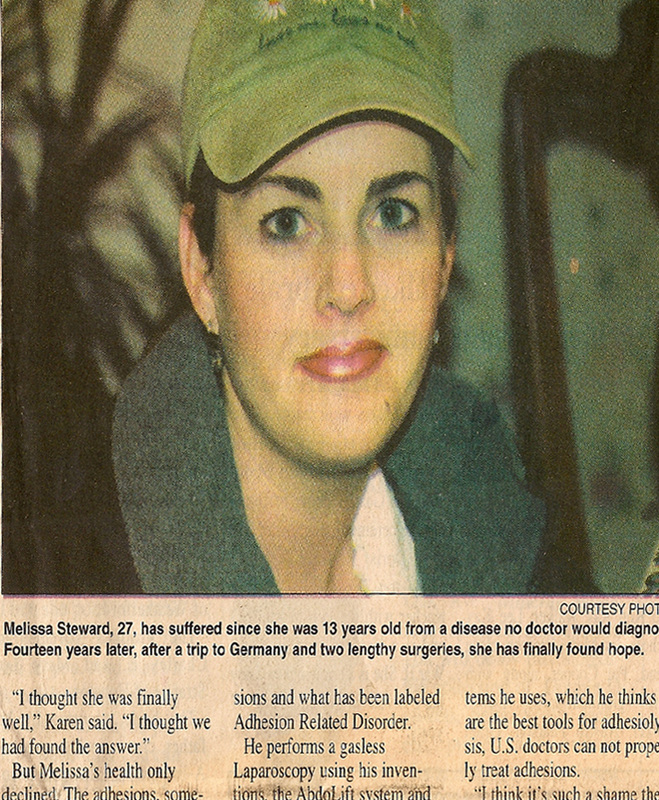 Fourteen years later, after all we’ve been through, I was not worried about any Iraqis.” Flying out April 8 and getting home April 22nd of this year, Melissa hopes after two surgeries she is finally adhesion free. “Melissa’s surgery was very difficult as she had adhesion at all her bowel parts and from the liver to the thoracic wall. A year ago she had a Laparoscopic adhesiolyses with carbon dioxide which probably made her worse than before,” Kruschinski said. He said without the two systems he uses, which he thinks are the best tools for adhesiolyses, U.S. doctors can not properly treat adhesions. “I think it’s such a shame the U.S. won’t acknowledge the treatment,” Karen said. Karen is now on a crusade to inform the public about the disease, help other women find help and bring Kruschinski’s treatment to the United States. Melissa’s father, Lonnie Steward, said the family is so thankful to see her well. Melissa and her entire family are eager to watch her heal and begin a new journey – the journey of life she has been deprived of since she was 13.